The diagram shows two piles either side of a strip foundation. There must be suitable access for the piling rig to both sides of the foundation for this system to work. The piles act under compression and carry the structures loads down to a depth where the ground is capable of absorbing them (often rock). Once these piles are in place, a concrete beam is cast beneath the foundation, spanning from one pile to the other. 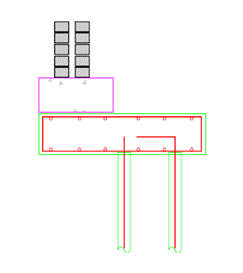 The diagram shows a tension & compression pile (tension pile on the right) with a cantilever beam spanning the piles situated under a strip foundation. 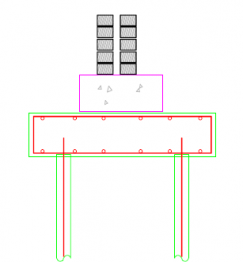 The compression pile transmits the structures load to a suitable load bearing stratum. Once the tension pile is suitably anchored in reliable ground (usually rock) it prevents any up lift at the end off the cantilever beam. This system is usually incorporated when access for the piling rig is restricted.